In 1988, Newport House Bed and Breakfast was built to museum standards from a 1756 design by famous architect Peter Harrison, making it Williamsburg’s most historically authentic Inn. With only two luxurious suites, we are able provide the best personal service to our guests! 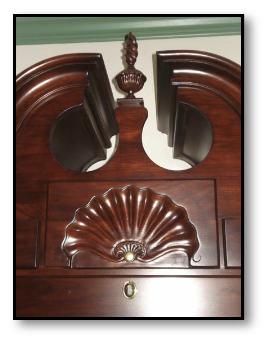 Our gorgeous New England Chamber's furniture includes several of the most important designs of the 18th century, including a queen and extra-long twin bed, dressing table, and bonnet-topped highboy. 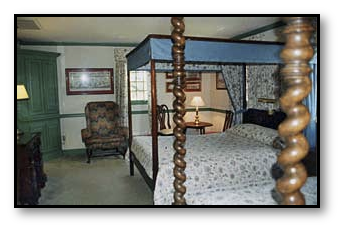 The Philadelphia Chamber is a large room with two 4-poster canopy beds for you and the children. Both chambers offer air conditioning and private baths. This finely finished Chamber (his Majesty's English for Bed Room), is finished to museum standards with numerous period-designed pieces. The New England Chamber has central air and a private Bath Room. For increased privacy, both chambers are above stairs (upstairs). "We could not have had a more pleasant stay anywhere else in Williamsburg than we had here with you – in-house costume-rental, country dancing, history lessons, nutmeg syrup, and … a rabbit! The two of you excel in charm, courtesy, and hospitality, and helped our vacation be truly memorable. Huzzah!" The Queen bed with stop-fluting was designed by architect Peter Harrison for John Townsend of Newport RI to construct in about 1770. The original of our extra-long twin bed with barley-sugar turnings was made of English walnut in Boston in about 1700. The dressing table with block-front decorated by carved shells was designed by Harrison and made by Edmund Townsend of Newport. 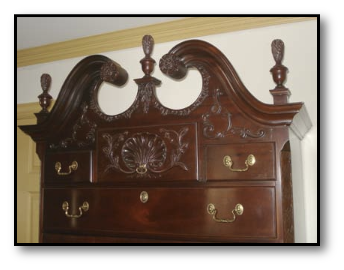 The bonnet-topped highboy with carved shells was designed by Harrison and made by the Townsend-Goddards of Newport. 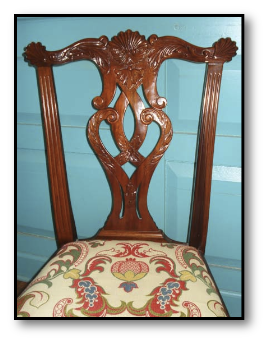 A 1760 side chair by Harrison and John Goddard of Newport has elaborate tracery. Enjoy a side of Williamsburg few are able to experience. Stay a five minute walk from the historic area in the beautiful Philadelphia Chamber. You will enjoy an authentic colonial experience with hosts who understand and love helping you on your vacation. 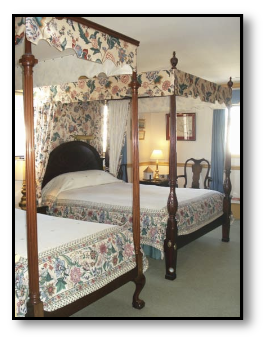 The Philadelphia Chamber is a spacious bedroom containing two 4-poster canopy beds (a queen and an extra-long twin), so you will not need to pay for an extra room, if you bring the children. "Thank you for giving our family such a restful, peaceful stay as we made the move from our old home in Williamsburg to Oregon. My 4-year-old daughter keeps talking about her favorite yellow house and the bunny. I keep thinking of the delicious breakfasts." 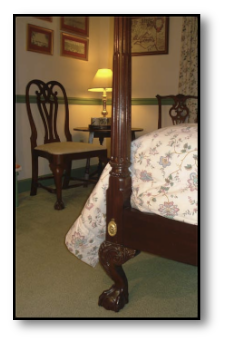 The original of our Queen bed was designed for George Washington in 1783 by Jonathan Gostelowe of Philadelphia. The exquisitely reproduced Philadelphia highboy was first made by James Gillingham about 1765. Also featured is precise replica of a Philadelphia armchair by William Savery about 1755. These are truly rooms built to museum standards. •	$159 - $229 for one or two people. •	$25 additional for third person in the room. •	A minimum stay of more than one night may be required on certain dates.